§9. The monstrous whale is prominent in medieval traditions, but it is not only kind of whale described. Medieval texts teem with images of mundane whales, seemingly far removed from their monstrous and supernatural kin. Anglo-Saxon texts, including Ælfric's Colloquy, or the Voyage of Ohthere, reveal the economic windfall associated with cetaceans, with little or no apparent concern with the animal's diabolical nature. Likewise, the Icelandic and Norse folk taxonomies, laws, and sagas speak candidly of whale exploitation and various whale species.10 Whales, while oftentimes threatening, appear as creatures found in the seas in great numbers and variety according to most Scandinavian traditions. They are of the highest utility to Norse sailors and settlers, they provide aid in fishing—some species are even protected from harm by stiff financial penalties—and they are the ultimate boon during famine. However, even in these most pragmatic descriptions and discussions of whales, we must ask whether the monstrous whales were ever truly forgotten. "The whale's reputation, already unsavory in antiquity, was only worsened by the accounts of its treachery in the Physiologus and Bestiary" (Ziolkowski 1984, 112). With this pervasive image of the monstrous whale firmly implanted in the minds of medieval audiences, we must question whether the symbolic association of whales with the Devil affected the material usage of whales. Joyce Salisbury (1994, 9), in The Beast Within, concludes that metaphorical meanings behind perceptions of animals "probably did not change the way [people] looked at the many real animals that were serving them." Yet when a massive whale washed ashore, there may have been some question among Christians as to the origin of the whale, that is, whether it was monstrous or mundane. §10. Medieval authors themselves debated the nature of whales and their apparent monstrosity, one author even going so far as to assert that the monstrous qualities of whales transcended death, imbued within the dead bones of these creatures. Some of the most original descriptions and analyses of whales occur in the works of Albertus Magnus (AD 1193-1280) and Olaus Magnus (AD 1490-1557). Each author claims to derive his data from observation or from direct witnesses of various phenomena.11 As Albertus says: "These facts about the nature of whales have been gleaned from our own experience. We have omitted what the ancients wrote because they do not accord with the practical knowledge of experienced fishermen . . . [who have] examined many whales at close range on innumerable occasions" (Albertus Magnus 14.19, tr. Scanlan 1987, 341). Of Olaus Magnus, Peter Foote declares: "Personal experience is an important element in the Historia [de Gentibus Septentrionalibus] and one can well believe, for example, that Olaus had watched a fishing community deal with a stranded whale" (Foote 1996, lvii). §11. Albertus Magnus, Dominican friar, saint, bishop, and mentor to St. Thomas Aquinas, described whales at length in his massive encyclopedic work De Animalibus. He included within the discussion of the animal category "Cetus" a host of marine mammals, including dolphins, whales, and even a few monstrous creatures. Albertus's descriptions include whale morphology, behavior, and the various means of capture and butchery employed by fishermen, as he observed at Dutch ports and whale butchering stations. He made an effort to set himself apart from ancient and earlier authors, to act as a good natural philosopher and to dispel myths of capricious whale behavior as described in ancient texts. Albertus writes that "the whale has a capacious mouth from which it spews large quantity of water when it breathes, an amount sometimes sufficient to swamp and sink small boats" (Albertus Magnus 14.15, tr. Scanlan 1987, 336). The whale did not intentionally destroy boats and men, as myth often contends; according to Albertus, such accidents were merely an aspect of their biology or behavior. He asked fishermen whom he observed to dispel myths of certain whale behaviors. For example, the female whale is said to descend to the depths of the sea after mating, where it fattens "to the size of an island . . . . I do not believe this to be true, nor do others who have first hand knowledge of whales" (Albertus Magnus 14.16, tr. Scanlan 1987, 337). Albertus's descriptions of hunting strategies, butchering, and whale behavior are among the most complex and accurate of the pre-modern period. He even offers us a lengthy description of a proto-Nantucket sleigh-ride six centuries before Melville (Albertus Magnus 14.18, tr. Scanlan 1987, 339-340). However, while Albertus seems to transcend the stereotypical definition of the monstrous whale, separating the mythic creature from its materials, other authors embrace medieval traditions, perceiving whales both living and dead as fully monstrous, literally "bad to the bone." §15. Insight into medieval perceptions of monstrous whales and their utility is most notable in Olaus Magnus, but especially in the Icelandic family sagas or Islendingasögur.13 The Icelandic sagas are perhaps our preeminent source for perceptions of whale utility in the North Atlantic world, as they provide numerous references to whale use, particularly whale strandings. A common topos exists in the sagas involving famine; a large stranded whale, usually a rorqual on disputed or common land; and a dramatic human conflict over the division of the stranded whale. This conflict always sees the invocation of law and often involves a physical struggle over the proper division of the whale. Throughout these stranded whale scenes, the drama is almost fully played out on the human level and is almost certainly played for comic effect, as in the famous whale stranding scene of Grettir's Saga. In this episode, the stranded whale, a great rorqual, serves as nothing more than a pretext for the human drama that ensues. In fact, the whale is quite literally the stage for the drama—serving as the platform upon which the battle is fought, while its bones and blubber become weapons and missiles: "I've heard how steely weapons were used, when whale-blubber was wielded at Rif Skerries. The fighters kept exchanging lethal whale-meat missiles. That's how these boors play the game of battle" (Grettir's Saga 12, tr. Fox and Pálsson 1974, 20). But not all whales in the Northern tradition were so benign. §19. The most notable episode of a dead whale's monstrous or supernatural essence affecting its material utility is recounted by Olaus Magnus in his description of whalebone houses of Northern Scandinavia. Within these houses the whale's monstrous nature lives on within its disarticulated, now architectural, bones. Whalebone houses are found in a handful of ancient texts and archaeologically throughout the Arctic, Africa, and Asia. 17 Olaus Magnus offered a unique perspective on the whalebone house, unseen in other sources. Olaus explains that the harsh climate of Arctic Norway does not allow sizable trees to grow, so wood is not readily available for building. However, provident Nature has taken thought for the inhabitants and enabled them to construct houses and all the requisite furniture within the gigantic ribs of these animals . . . it is a known fact that the bones which remain are so strong and enormous that people can produce from them entire homes: walls, doors, windows, roofs, chairs, and even tables. The ribs are twenty to thirty feet long, or even more, while the spinal vertebrae and the forked bones of the colossal skull are themselves of no small magnitude . . . . Once the flesh and internal organs of the massive beast have wasted away and perished, only the bones remain, in the shape of a huge keel. After the skeleton has eventually been cleansed by rains and fresh air, strong men are enlisted to erect it in the form of a house. The one who is supervising its construction exerts himself to put windows at the top of the building or in the monster's sides, and divides the interior into several comfortable living quarters. The doors are made from the creature's hide, which has long since been stripped off for this or some different purpose and hardened by the rough winds (Olaus Magnus 21.22, 24, ed. Foote 1996, 1105, 1107). Even when the whale bones were fashioned into a house, there remained a recognition that the house retained the character of the whale. The windows are described as on top of the structure, but also in "the monster's sides" (Olaus Magnus 21.15, ed. Foote 1996, 1098). The house not only served as a domestic space; it simultaneously retained some elements of its animal form and character. §23. Few archaeological artifacts tell stories of their construction, their utility, or perceptions held of their material of creation. It is difficult to diagnose the primary function of many objects, much less the perceptions held of them. Objects bearing inscriptions, though, do tell stories, often of their ownership or lineage, their religious dedications, or perhaps function. Few objects speak as voluminously as does the Franks Casket, a small lidded whalebone box from eighth-century Northumbria. The Franks Casket, the most famous medieval whalebone artifact, provides compelling testimony on how perceptions about a creature may affect the use of its material resources. This exquisite casket is bedecked not only with iconography from Christian, Germanic, and Roman traditions, but also bears carved Latin and Runic inscriptions. The front panel of the casket—showing scenes of Weyland the Smith and the Adoration of the Magi—offers the following inscription, which rings the front panel: "The fish (fisc) beat up the sea on to the mountainous cliff. The king of terror became sad where he swam on to the shingle. Whale's bone" (Webster and Backhouse 1991, 101). §24. 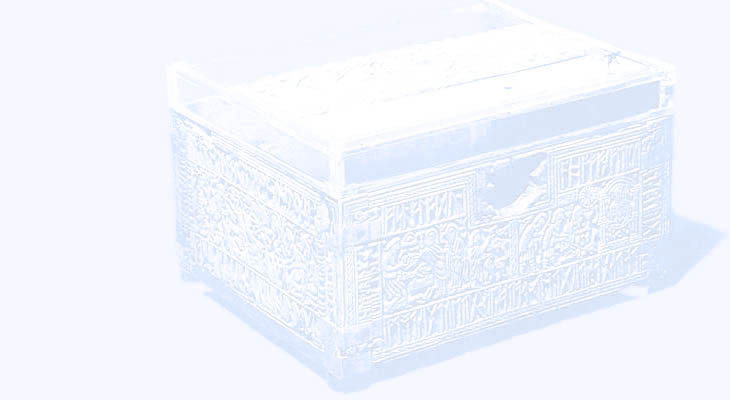 In this inscription, the material of the box is identified alongside the manner of the acquisition of the material—the stranding of the whale, the so-called king of terror. This inscription may have elevated the status and value of the object itself, for it was crafted from the bones of the "king of terror." Would this material, like the bones of the whalebone house, not be considered somewhat exotic or powerful? Clearly the material must matter, otherwise its origins would not have merited mention. However, the question remains whether the material was thought to impart any of the essence of its former existence. One must question whether the material would have merited inscription if it had been something more mundane; the archaeological record offers few such examples. The inscription implies that the material itself is as fantastic as any of the magical iconography spanning the box. The Franks Casket, when considered alongside literary evidence for the significance of whale symbolism, reveals that perception of the animal could impact how materials were valued and received, if not used. Most archaeological evidence, though, is less forthcoming in revealing how cultural perceptions impacted the use of an animal. However, consideration of numerous North Atlantic assemblages of whalebone artifacts may reveal more than historians or archaeologists hitherto have appreciated.